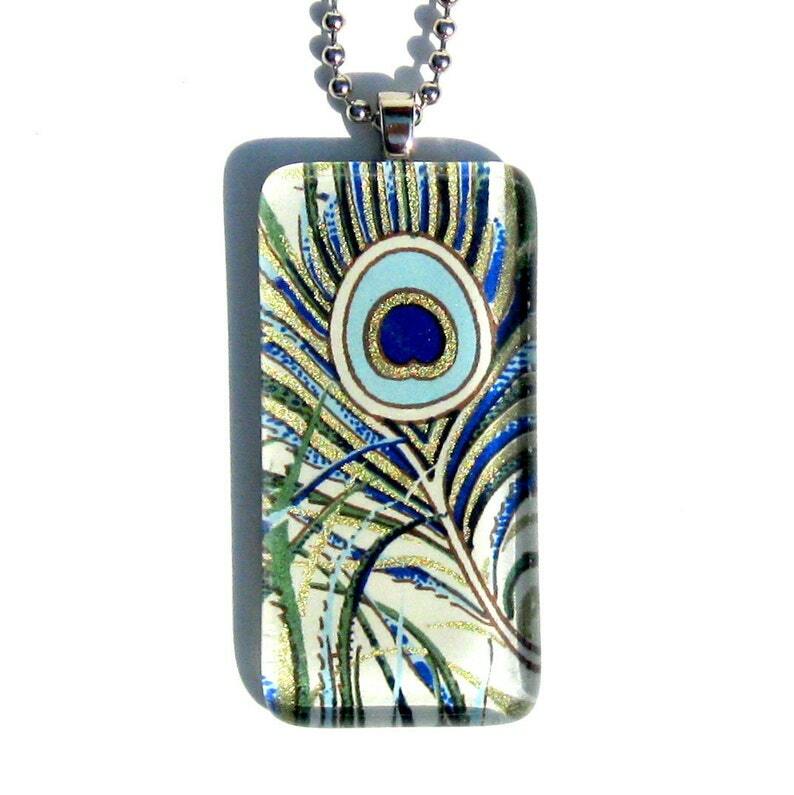 Updated and very feminine, this dogtag style pendant is perfect with a simple blouse or tee. This season, long chains are in and this one appropriately dangles from a 24" silver plated ball chain. This Japanese chiyogami (old-paper) features a more modern version of a peacock feather in cobalt and aqua with hits of green gold leaf.. The thick 1/4", handcut glass gives off amazing depth and reflection to the age old paper. I love this necklace with a crisp white top. This necklace comes beautifully packaged in a coordinating gift tin. Makes for a fabulously quick and easy gift. Just add a card and you're done! Pendant measures 7/8" wide x 1 3/4" long (closer to 2" when you account for the silver bail) and never weighs heavy around your neck. It's sealed to protect against water, oils and stains, but may not be water-proof. ALSO AVAILABLE IN MY SHOP: 16" , 18" CABLE CHOKERS and RIBBON NECKLACES!http://www.etsy.com/shop/gamiworks?section_id=5384041PICK YOUR COLOR AND ADD TO YOUR ORDER TO EASILY CHANGE THE LOOK OF YOUR GAMI PENDANT & THEY SHIP FOR FREE!